I think it’s a pretty well known fact that hospital food is terrible. It’s definitely hard for a self-described picky person as myself since the options are quite limited. I think I’ve been given 15 cheese sandwiches since I’ve been here. My favourite meal has always been breakfast, I just love myself a big breakfast whether it’s eggs or oatmeal, it’s something I look forward to that impacts my whole day. Unfortunately, even the breakfasts here are, well, unimaginative, and unfortunately, not super healthy. 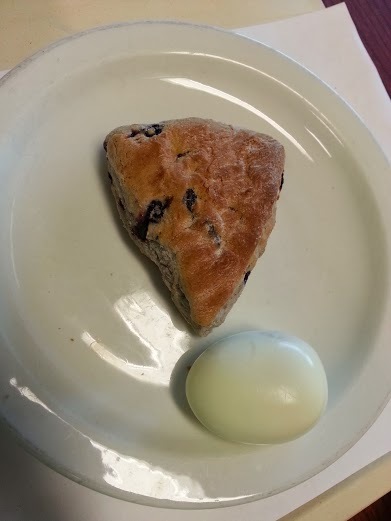 One of the most popular items is a hard-boiled egg, served with scones usually. I don’t know exactly why, but every time I see that little egg sitting there on my plate, it angers me. I hate that egg. Seeing that egg first thing in the morning depresses me. I refuse to eat it, and those days I usually make myself a bagel or oatmeal from my supply. Maybe it has something to do with the fact that I would never normally eat a hard-boiled egg on the outside, or maybe it’s just because it sits on the plate, boring and blah looking. Whatever reason, I hate that damn little egg. This entry was posted in Hospital life. Bookmark the permalink.